BASS LAKE – A tradition that has quickly gained a following in the mountain communities resumes May 22 as the Certified Bass Lake Farmer’s Market prepares to start its sixth year. Put on by the Bass Lake Chamber of Commerce, the weekly market takes place at The Pines Village and includes numerous vendors as well as live entertainment. “It’s a very fun event, we have live entertainment, it’s very much a social gathering as much as it is a farmer’s market. It’s the place to be every Wednesday,” said Chuck Nugent, owner of Good ‘Ole Daze in The Pines Village and coordinator of the market for the Bass Lake Chamber. He said about 500 people show up for the market each week. The Bass Lake Farmer’s Market is certified, meaning that all vendors sell only produce grown on their farms as opposed to reselling fruit and vegetables sourced from other growers. The market is also different than others, according to Nugent, for its vendor choice. “One of the great things about the market is two of our fruit and vegetable vendors are sought after by almost every market I the state. Sunny Farms and Shasky Farms are two of the best and we’re really fortunate to have them,” he said. “Some markets have a lot of vendors, but there is lot of repeat. We focus on quality over quantity, have some of the best vendors and we don’t duplicate,” Nugent said. Other returning vendors are Blossom Trail Honey, Yosemite Sierra Specialties, Jammin Jams and Bluebird Trail Farm and Three Springs Flower Garden. New to the lineup this year is William D. Jones Blueberry Plants. 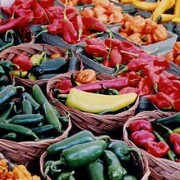 The market opens at 4 p.m. and runs until 7 p.m. each Wednesday through the month of September. For more information, call Chuck at (559) 642-8163.